Thank YOU for YOUR Support of Kansas Law Enforcement! The Kansas Peace Officers Association is a 501(c)(4) organization and the largest law enforcement association in Kansas. The KPOA works hard to provide services to our members and all law enforcement officers throughout the state through training, death benefits, and the lobbying for sound laws in Topeka that promote the safety and welfare of all citizens in Kansas and our peace officers alike. The association promotes the professional and ethical trust between law enforcement and our citizens. The state of Kansas is one of the greatest states in the union in the respect shown by our citizens towards law enforcement. The KPOA is solely funded through membership dues and the financial support and generosity of businesses and citizens like yourself. We truly appreciate all contributions of any amount. 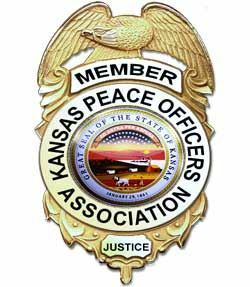 Contributions to the Kansas Peace Officers Association are NOT deductible for federal income tax purposes as charitable contributions.